Premium quality vectors are amazing! We all love working with hand-crafted works of art, created by serious designers. They leave those cheap stock looking vector graphics (think 90’s Powerpoint presentation style) in the dust! This all new bundle brings you 1000s of the best premium vectors in the world, without the premium price tag! This vast collection would typically cost you $2847, but for the next 2 weeks it’s available for just $29! 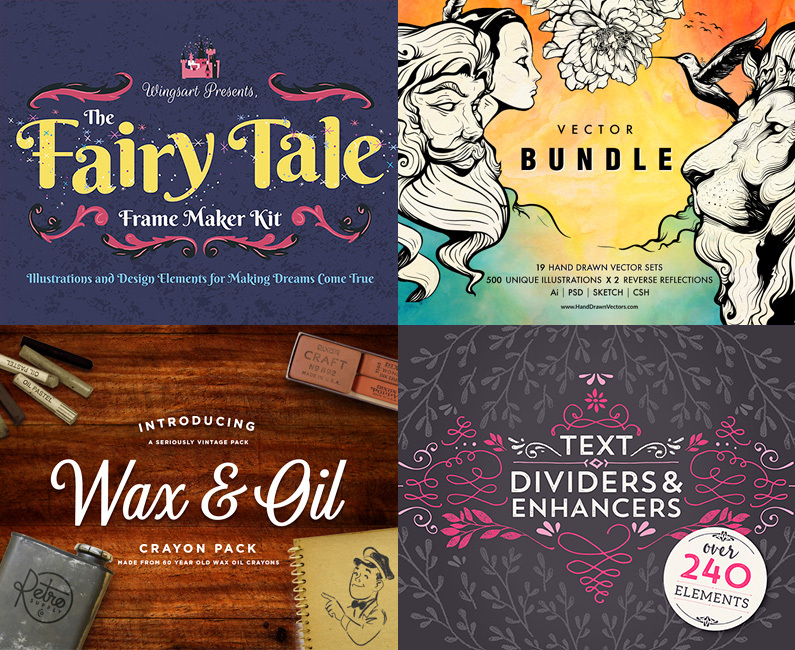 This bundle is so huge that we reckon it would take you a lifetime to reproduce all the awesome graphics inside! You can discover ultimate variety, from detailed illustrations, to vintage images, textures, brush sets, and those always-useful ‘building block’ elements such as frames, shapes and dividers used to construct your wider designs. With our helpful guides, you can easily find the graphics that you need for your next project. Browse your new collection by designer, file name or top level overview. If you want to quickly locate a ‘tree’, ‘pattern’, ‘snowflake’ or other type of resource you can do so in a matter of seconds! Introducing a fun-to-use Whimsical Winter set! Meet Bear, he loves winter! He also loves hanging out with his friends and decorating his Christmas tree. And he can’t wait to be part of your next creative project! This whimsical winter graphic set is filled with quirky illustrations and items ready for you to sprinkle a little magic into your projects. And if you’re pushed for time, or need a little inspiration, I’ve included three pre-designed winter scenes to get you started. Bear and Friends are perfect for quote art, greetings, blog posts, Christmas cards, social media banners and so much more! It’s versatile and super useful, introducing the very handy Text Dividers & Enhancers! With over 240 elements, I wanted to make this kit an all-purpose, truly affordable pack that you’ll get loads of use from. I’ve included elements that work great for wall art, logo design, blog post, invitation, branding and more. And to cover all bases there are both authentic pencil illustrations as well as smooth inked elements all hand sketched with care. This kit has both vector and .PNG elements giving you the freedom to choose your preferred software for creating. Software compatibility: Adobe Illustrator CS and newer. .JPG and .PNG files will work with most graphic software. This bundle offers you all of our products in one complete and extensive pack. Each and every one of these realistic illustrations is extremely detailed and thought through, we guarantee a level of detail and illustration you have never seen before. • All hand drawn vectors are made in illustrator and converted to your favourite file formats, so no matter what software you are using you’ll find the format that fits you. 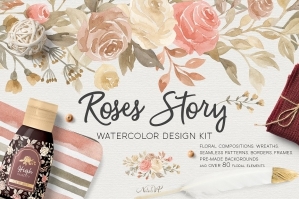 • This bundle will receive regular updates and add ons as we are working on additional sketched elements for you. Some of the uses of these elements are logos, t-shirt design, book covers, custom illustrations, post cards, website headers, or whatever you need them according to your designs…needless to say that you can apply your own watercolour effects to them and create even more unique styles. Software compatibility: Adobe Photoshop and Illustrator CS5 and newer. Files for Sketch have also been provided. Introducing The Fairy Tale Frame Maker Kit! Inspired by my favourite vintage children’s books and classic animated movies, this set includes a wealth of illustrated elements, design templates and seamless patterns ready and waiting for you to make someone’s dreams come true. 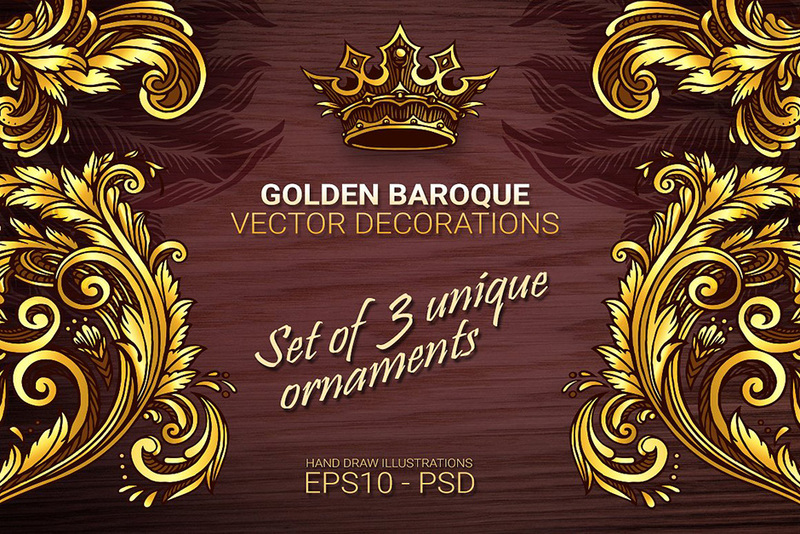 A huge collection of professional quality illustrations ranging from the festive Christmas tree, toy soldier and ballet dancer, to victorian style gothic portraits, floral elements, banners and flourishes. There’s everything you need to quickly create beautiful cards, posters, invitations or word art. I’ve included several examples of my own to get you started, including design templates with pre-set text paths, decorated initials, posters, Valentines, Christmas and New Year cards. Take them and customise at will, and have amazing fun creating your own designs. Everything you can see is included in your download. • All fonts used are freely available from Google Fonts. Links are included in an enclosed help file. Software compatibility: Adobe Photoshop and Illustrator CS1 and newer. .JPG and .PNG files will work with most graphic software. Super-Realistic Wax Oil Vector Brushes Made from 60-Year Old Crayons. Inspired by a pack of 1950s wax oil crayons we found just sitting in a garage – hence the name – these brushes recreate the rough, unfiltered sketches made by commercial artists in the mid 20th century, and will add that vital human touch to your designs and illustrations. We found real 60 year old wax oil crayons and converted them into art brushes for Illustrator. As you can see from the example images the texture nails the look of wax oil crayons. We also worked hard to strike a good balance between realistic looking brushes and anchor points so they won’t slow down Illustrator. Note: Use any brush like this enough and Illustrator is going to give you the spinning wheel of death. So no coloring in gigantic areas with a bazillion strokes. Also, like any product of software, the more RAM you have the better. It’s so much nicer to open up an .AI or .PDF file and see examples of all your brushes laid out (instead of loading them and guessing what they look like). Plus, we lay out the reference sheet so it looks great and include stories and tips for using the brushes. I absolutely hate when I buy a digital product and the instructions are a plain text file. It’s annoying to read and lazy. That’s why we made the instructions as a full color .PDF with pictures and headings so you can easily find the information you need. The Sacred Snowflake Vector Set (Paper Edition) illustrations draws its inspiration from the naturally occurring designs of sacred geometry found in nature and the intricate German paper-craft tradition of “Scherenschnitte” or “scissor-cuts.” These illustrations are great for crafts, decorations, gifts, and much more. Use the perfect blend of the traditional and the sacred in your creative projects this season. Our Sacred Snowflakes Set includes 12 unique, elegant, hand-crafted snowflake designs as well a variety of elements in our Kit to create your own unique designs. All illustrations are vector-based and easy to modify with basic Illustrator knowledge. Vector files scale to any size so whether your printing on a business card or a billboard, these illustrations will always be pixel perfect. Software compatibility: Adobe Illustrator CS6 and newer. .PNG files will work with most graphic software. The Sacred Snowflake Vector Set (Starry Edition) illustrations draws its inspiration from the naturally occurring designs of sacred geometry found in nature and the style from our best-selling constellation vector sets. 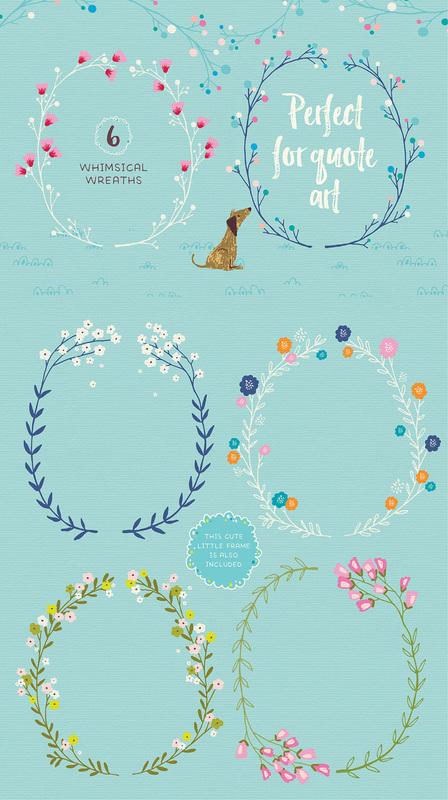 These illustrations are perfect to use for crafts, decorations, gifts, and much more. Use the perfect blend of the traditional and the sacred in your creative projects this season. Have your past experiments with vector halftones resulted in disaster? Does the thought of adding authentic distressed halftones to your vector work make you worry? Struggle no more, Vector Saviour is here! This set of distressed vector halftone patterns for Adobe Illustrator will save you precious time and absolve you of past vector woes, allowing you to seamlessly add hand crafted vector halftones, lines and textures to your illustrator artwork in moments. Each seamless pattern is crafted from real world paper textures and repeats endlessly. Fill any shape with your chosen texture, or paint your textures in using the brush or blob brush tools. Change swatch colours quickly and easily using the Pattern Options palette. Heal your previous woes with Vector Saviour today! • 12 x Distressed Halftone Line Patterns in vertical, horizontal and diagonal angles with 3 different size presets in black and white. 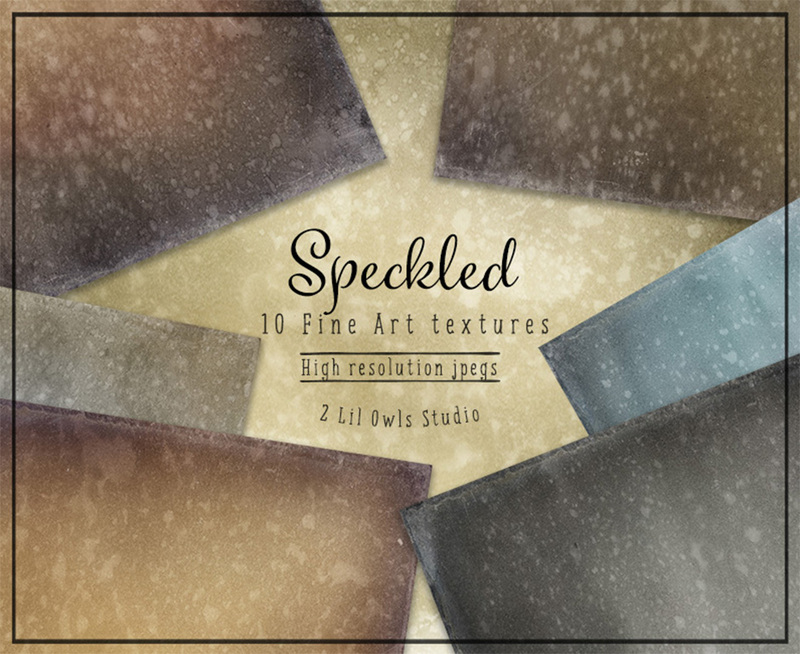 • 6 x Distressed Texture Patterns, each in 3 different size presets in black and white. • 1 x easy to follow, comprehensive installation guide with tips on changing the colour of your swatches. • Clearly named and organised lllustrator files for quick copy/pasting of swatches. • Installable pattern swatches for fast repeat usage. 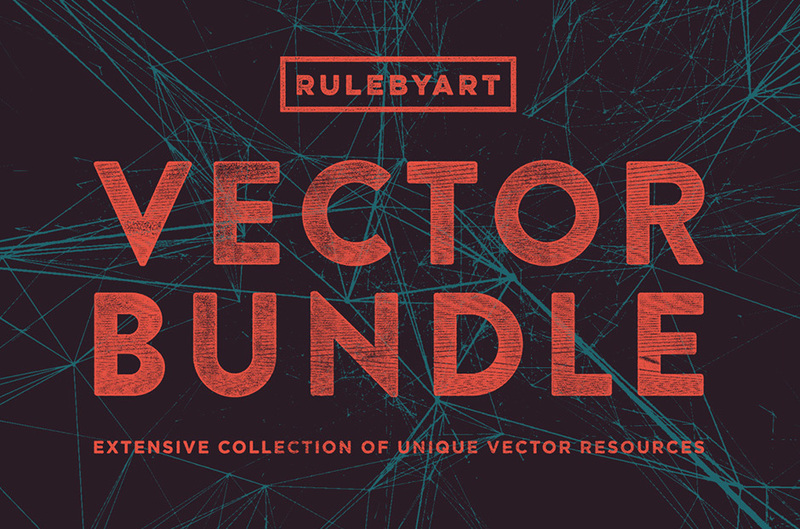 This is a collection of Rule By Art’s best and finest vector packs featuring sets such as 15 Ink Textures, 18 Organic Textures, 15 Eclipse Shapes and many more. Ink is a set of 15 unique vector textures that evoke a sense of brush strokes splashed across a canvas. The possibility for new and original compositions within these 18 images is countless. You can also overlay tons of colour schemes to create a totally different effect within the same image. Organic is a collection of 18 vector organic textures. Each image is unique from the next and vary in appearance from cell textures and wood grains to topographic maps and space imagery. 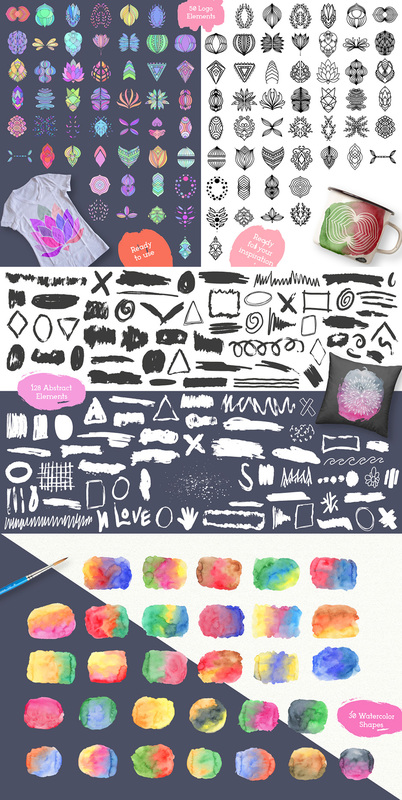 Paint Kit is a set of high quality vector painted shapes. Each shape has 3 texture variations – original, canvas and halftone. Use the Paint Kit in many many different ways. Examples could be holding shapes for Logos, backgrounds for lettering, use it for merchandise and branding projects or in magazines and books. These are just a few ways in which Paint Kit can take you project to the next level. Have a look at some simple examples in the images, its up to you and your creativity to create some awesome looking designs and have some fun with the Paint Kit, it’s sure to be a useful part of your design arsenal. Software compatibility: Adobe Illustrator CC, CS5 and newer. A superb and professional collection of 235 Minimal Logo Templates and 320 Geometric Logo Marks created for beginner and expert Designers. It allows you to design a brand new logo in 3 minute using Photoshop or Illustrator. Mix the premade logos with your favourite logo mark to get stunning results! The possibilities are almost endless! The complete pack is hundred percent customizable and scalable in both Photoshop and Illustrator (every text, shape, line, color, texture). The fonts used are free for commercial use, and of course you will find a complete list with each download link :). 320 eye catching Geometric Logo Marks with fully editable paths, you can make them thicker or thinner, add a texture or just a flat color. Software compatibility: Adobe Photoshop and Adobe Illustrator CS2 and newer. Digital clipart gold foil swashes with a letterpress effect. Ideal graphics for your bridal invitations, party supplies, printable cards, designs, anniversary cards and everything else. • 1 .EPS file with the 20 vectors in black only. The .EPS file doesn’t contain the gold foil letterpress effect. Software compatibility: Adobe Illustrator CS2 and newer. .JPG and .PNG files will work with most graphic software. A set of 55 watercolor Autumn illustrations. Very stylish, colorful and detailed illustrations. Illustrations are drawn by hand and vectorized. You can make many compositions (bouquets, wreath and banners) from the separated elements. Perfect graphics for making design projects, cards, patterns, greeting cards, posters, website, DIY and other projects. Bonus – seamless pattern and frame. Formats – .AI, .PNG and .JPG. Software compatibility: Adobe Illustrator CS6, CC and newer. .JPG and .PNG files will work with most graphic software. A gorgeous set of 15 watercolor tropical leaves illustrations. The illustrations are drawn by hand and vectorized. You can use it for making design projects, patterns and other projects. Formats – .AI, .EPS, .PNG and .JPG. A set of over 25 watercolor illustrations. Very stylish, colorful and detailed illustrations. Illustrations are drawn by hand and vectorized. Perfect graphics for making design projects, cards, patterns, greeting cards, posters, website, DIY and other projects. The complete set of 123 Hand Drawn Rustic Objects and Wood Grain Textures. 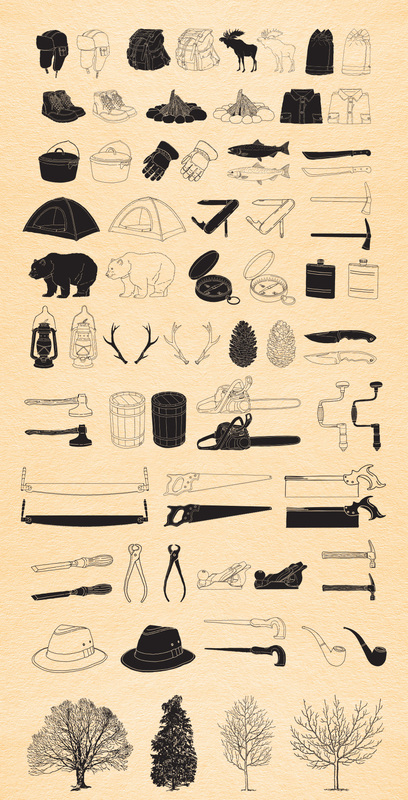 A set of rustic hand drawn vector elements. These elements will fit for all rustic, forest, retro or nature themed projects -logo, posters, postcards or even apparel designs. Vector files are delivered in Adobe Illustrator CS3+ and .EPS 8 file format (vector files can be edited, recolored, enlarged and printed at any size) and 10 inches at 300ppi .PNG images. Software compatibility: Adobe Illustrator CS3 and newer. .PNG files will work with most graphic software. Unember: Vector Supply Volume 25 contains 50 beautiful vintage illustrations, sourced from genuine rare print published in the United States, 1920. • 50 vector illustrations from the US, 1920. Highly detailed and optimized graphics, grunged natural worn ink, perfect for high quality vintage print. • The pack includes a collection of rare vintage accessories, fountain pens and other illustrations, suitable for contemporary projects. Unember: Vector Supply Volume 26 contains 50 weathered illustrations, sourced from genuine vintage print published in Chicago, 1914. • 50 vector illustrations from Chicago, 1914. Highly detailed and optimized graphics, grunged natural worn ink, perfect for high quality vintage print. • Vintage illustrations crafted from a genuine catalog published in United States over 103 years ago – the pack includes a great variety of vintage goods for creative projects..
Unember: Vector Supply Volume 27 contains 50 genuine retro illustrations, sourced from weathered scarce print published in Chicago, 1919. • 50 vector illustrations from Chicago, 1919. Highly detailed and optimized graphics, grunged natural worn ink, perfect for high quality vintage print. • Vintage illustrations crafted from a genuine catalog published in United States over 98 years ago – the pack includes a great variety of vintage goods for creative projects. Herbalitica is a hand drawn medicinal herb collection, it includes 8 unique sketched plants – Valerian, Echinacea, St. John’s Wort, Clover, Dog-Rose, Chamomile, Calendula, Lavender. In order to make designing easier, I have also included 50 carefully separated elements from the original plants. Vintage flowers are always in demand – they are used in cosmetics and pharmaceutical packaging, surface pattern design, stationery, logos and many more! • 8 herbs grouped in .EPS10 and individually in .PNG, .JPG (average size 2900 x 5000 px (approx. 10 x 17 in), 300 ppi, RGB. • 50 plant parts grouped in .EPS10 and individually in .PNG, .JPG files (size vary from approx. 500 x 540 px (approx. 1.8 x 1.6 in) to 2300 x 2800 px (7.8 x 12.8 in), 300 ppi, RGB). I present Ancient Colors Flowers – .PDF and .EPS files. Ideal clipart graphics for invitations, cards, wedding invitations, DIY projects, greeting cards, logos, cases, print design, branding, packaging, posters, wallpaper, blogs, website, advertising and more. I present Washed Colors Flowers – .PNG and .EPS files. Ideal clipart graphics for invitations, cards, wedding invitations, DIY projects, greeting cards, logos, cases, print design, branding, packaging, posters, wallpaper, blogs, website, advertising and more. This is the second magical collection of more than 400 mandalas for every taste. Are you a shopkeeper or a flower designer? Or if you have a yoga school or a shop with toys? Maybe you a decorator or create beautiful things? Create a logo or branding of their dreams. You can easily combine mandala, abstract elements and watercolor shapes. Or simply add a mandala circle on your photo. Software compatibility: Adobe Photoshop and Adobe Illustrator CS3 and newer. .JPG and .PNG files will work with most graphic software. 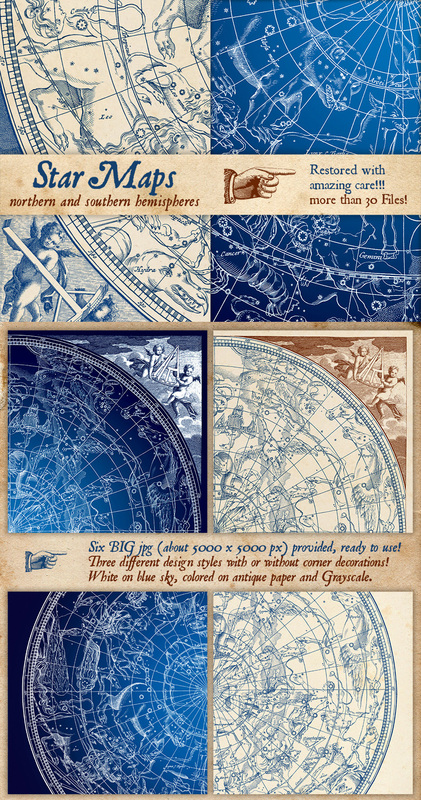 Around the Globe is the collection of 167 rubber stamps in a retro style of an old real travel stamp. Can be used for an imitation of a postmark, label for your local products, or they are perfect for your travel journal or sketchbook. Each stamp have a country name, it’s map outline and name of the continent. Dirty effect ink texture will make your design more realistic. Texture is 100% vector. Please note that text of stamps can’t be customized. Mockup files are not included. Software compatibility: Adobe Illustrator 10 and newer. .JPG files will work with most graphic software. This set of two beautiful illustrations of the Northern and Southern Hemisphere constellations are inspired by the original illustrations of Johann Baptist Homann (20 March 1664 – 1 July 1724) and were originally included in the opera “Atlas Novus Coelestis” published in 1742 by Johann Gabriel Doppelmayr (1677–1750). Both illustrations have been restored with great care and are presented in both very high resolution raster and vector format. Both illustrations has been included with the original beautiful corner decorations, but also only with the isolated central illustration if you are in need of a circular design. The range of different formats included in the downloadable archive allows every designer to work with them. But the images provided can also be used for a wide range of different designs, simple prints, or combined with custom backgrounds, arts and photographs, to create custom graphics. The only limit is your imagination. • .JPGs: Each illustration is presented in three styles, white on a blue shaded background, colored illustration on vintage paper and grayscale on white background, for a total of 12 .JPGs. • .AI and .EPS: Both illustrations are available on a multilayer, full vector file. .AI file is CS5 compatible while the .EPS is Illustrator EPS10 compatible. Source files can be edited with both vector applications like Adobe Illustrator, CorelDRAW or Inkscape, or raster editing applications like Adobe Photoshop, Gimp or Corel Paint Shop Pro. Software compatibility: Adobe Illustrator CS5 and newer. .JPG and .PNG files will work with most graphic software. This bundle offers huge variety of quality, unique vector elements, including hand-illustrated graphics, seasonal vectors, industrial elements, decorative flourishes & florals, textures, logo packs, geometric shapes and much more. File size is approx 6.3GB (11.08GB unzipped), split into 22 parts - one link per designer or an optional one click download. A .PDF guide has also been provided for easy browsing. Thanks for the comment on this one- I am so sorry that you missed out on this one! I really wish I could help with this one but the deal is now well and truly finished, so I won’t be able to set you up with this. I hope this helps, Gabriel! If you have any other questions or if there is ever anything else I could assist you with please do get in touch. I’m always happy to help! is there a chance to get my hand on this bundle, missed it! Thanks for the email on this one and i am so sorry to hear you missed out on this one! I have sent you over an email that might be able to help a little :). Is there a way to still get this deal? I missed getting this deal because my computer was down. Please let me get this deal. Thanks so much for commenting! I’m so sorry to hear that your computer was down and you missed out on this bundle. Rest assured, I’m here to lend a hand 🙂 I’ve sent you an email to assist you with this. Yes! I bought this deal at the last hour and it is super sweet. I’ve already made this week’s promo with art from the vector deal and end of year deal. I did two promos with the end of year deal last Dec. I make art for a Band and this vector deal has so much! I’m a little old school, doing mostly pre-press stuff lately, it really helps me to dissect this stuff and learn more modern techniques for art. I’m really annoyed with myself. I looked at the this bundle yesterday with the intention of buying it today when I had a bit more time. But I didn’t realise that expiry was imminent. Any chance of a late purchase ? Please ?? I hope it helps, Mark, and if you have any other queries please do let me know! I have a problem with downloading the bundle. Is there any problem with your server? I buy graphics from this site regularily and this is the first time when I can’t download it at all. I’ve sent you an email to investigate this further and see what is occurring for you. I hope it helps, and please don’t hesitate to contact me should you have any other questions. I’m here to help! You are very welcome, Margareta! 🙂 I’m really pleased I could help! Thank you for your kind words and if there is ever anything else I could assist you with please do get in touch. I’m always happy to help! Ugh!!!!! It was in my shopping cart and everything. Then I fell asleep last night… and I missed it. Oh… woe is me…. (sad face). Thanks for your comment, I’m really sorry to hear that you missed out on this vector bundle! Rest assured, I can certainly assist you with this 🙂 I’ve sent you an email to help get you up and running again. I hope it helps! Great bundle – as always! Just one thing: I wanted to use some textures from Rule by art, unfortunately all the eps files are created for the newer AI than I’ve got. Is it possible to get them for AI CS3? I understand some files cannot be saved for older versions of Illustrator, but these eps are textures, so I guess it shouldn’t be a problem. Hope you can help! Thanks! What are the fonts used in the illustrations? Absolutely love all your products. Amazing collection of resources as always. Very difficult to not buy every single bundle. The quality of all the products you guys chose is just unbelievable especially for the price! Just one thing, I’m based in China, it is super painful to download the files every time, I actually have a 200M line which is very fast with all other downloads, but for some reason( – maybe different countries? I don’t know.. ) the connection to your server ( or wherever you host all the files ) are really not great, it always takes a period of days to get all the files. Usually say a 800M file takes me maybe 10mins tops. But same size files from your site could take 4,5 hours and the most annoying thing is sometimes it fails half way… Please is there any way you guys can help improve the download speed for people who’s not based in UK? Thank you for getting in touch with your kind words! It’s fantastic to hear that you are enjoying your purchased resources 🙂 We hope they’ve made a really useful addition to your creative toolkit! I’m so sorry to hear that you are having some trouble downloading your resources! I’ve just double checked this on my side and our download links appear to be working correctly but rest assured, I am on the case to investigate this further for you. I’ve sent you an email to get some more information from you and help get you up and running with your items. I hope it helps, Paris, and please don’t hesitate to contact me should you have any other questions. I’m here to help! Thanks so much for getting in touch so quickly. Just difficult and slow downloading from where I am. And it could easily just because different locations / countries. Just wanted to let you guys know and in case there’s something you can do to help improve the speed. But I do absolutely love your products, in terms of quality and value for money, you guys are definitely the BEST! Thank you so much for getting back to me and letting me know! I’m so sorry again that the download speeds are still going slowly for you but please do let me know how you get on with the links I sent you and if you need any further assistance getting up and running with your bundle, please do let me know and I will happily lend a hand. Thanks so much for your incredibly kind words! We really appreciate your support 🙂 I hope this helps, and please don’t hesitate to contact me should you have any other questions. I’m always happy to help! Woah amazing. Such incredible and useful vectors. Designing already (mentally) and I haven’t even downloaded yet! Nice job, folks. Unrelated (but giving me bruxism): I missed the Mockup Bundle! Aaugh! Any chance you will repeat that, or something like? Thank you so much for getting in touch with your incredibly kind words! It’s great to hear this bundle is already inspiring some creative ideas for you 🙂 We hope you love working with them all! I’m sorry to hear you missed out on our Mockup Bundle! This is now unfortunately expired but rest assured, there are some awesome new mockup resources on our radar at the moment so we should have one coming up very soon 🙂 If there are any particular mockup resources that you have your eye on, please do send me some links and I will do my best to feature them for you! I hope this helps, Elizabeth, and thanks again for your lovely comment! Please don’t hesitate to contact me should you have any other questions. I’m always happy to help! It’s like I got 25% off the Fairytale item and an added bonus of beautiful artwork and a LOT of freebies thrown into the mix! We hope you enjoy working with them and if there is ever anything I could assist you with please do get in touch. I’m always happy to help! Not every bundle can be a 100% for everyone. I’m still loving the Laura Worthington fonts I got from you recently and I made extensive use of past vector art I purchased from you in crafting tags and labels at Christmas. I’m a very happy customer. The beauty of your bundles is that even when the bundle has many things I personally have no need for, there is STILL a great deal to be had in the several pieces that I really, really want to own. There’s always a bright side: selectively downloading files from this deal means there’s still lots of room left on my hard drive for the *next* bundle. That is fantastic to hear, Mish 🙂 and it’s also great to hear that there’s some space on your hard drive for our upcoming bundle 🙂 We hope you really like it! Thanks again and Happy Designing! It’s great to hear how happy you are with my Fairy Tale illustration pack. I love that it’s got your imagination flowing and i’d love to see what you create with it. It looks like a lot of fun to play with and it’s completely different from the other items I’ve purchased. I have a couple of nieces who are gaga for fairy tales right now and my first thought was all the cool b-day gift tags I could personalize for them and then onto other possible gift ideas. Thank you for agreeing to be a part of this bundle! Another beautiful irresistible bundle – I love it! You guys are the greatest. Each month I hope there is something I can resist and not buy, and each month that hope is dashed! Rock on! And thanks! Thank you so much for your lovely comment! It’s so great to hear that you are loving your new vector items 🙂 We hope they make a fantastic addition to your creative collection! Can this be used in Affinity Designer? Thanks for your comment! I can certainly help you out with your query. I hope this helps, Carlos, and please don’t hesitate to contact me should you have any other questions. I’m here to help! I’ve purchased this beautiful bundle, and I am SO EXCITED to get started. QUESTION though — Where is the Browsing Guide that is said to be attached? I’m really sorry for any confusion. Your Helpful Document files are in their own independent download link that can be found next to the complete download link in your account after you select ‘View Files’ on your bundle. I hope this helps, Laura, and please don’t hesitate to contact me should you have any other questions. I’m always happy to help! Great set! What is the font used on Herbalitica? It’s awesome! Any bundle with Lisa Glanz & Julia Dreams sets is an automatic winner. Goodbye $29 hello adorable anything I want. It’s going in the cart. Thank you so much! It’s awesome to hear Lisa & Julia Dreams made this bundle a must-have for you 🙂 Thank you so much for your purchase! WOW! Excellent deal! I’m currently working on a project for which fit these wonderful illustrations. Features product with Mandalas. I can use it in various projects. I for the first time on your site, necessarily buy the deal. Your bundle as always excellent! We hope you have loads of fun working with them all and please don’t hesitate to contact me should you have any questions. I’m always happy to help! WOOOOO HOOOOOOOOOOO!! Do you guys know what TIME it is? IT’S VECTOR TIME!!! Hahaha and I’m all ready for it!! It’s that time already?! Woohoooooo! Thank you so much for your incredibly kind words, Iskandar! 😀 We’re so pleased to hear this bundle has you doing the vector dance! Here I was, working on a project that required a skull, so I go to my account to download some skull packs from a very recent bundle. Then I looked at the calendar and thought, oh I bet they have a new bundle up, so I look, and SOB look at that skull on that pack up there. It’s going to be great with the other one in a dual tone thing I’m doing. You guys are killing me. Thank you so much for your kindness and I am so sorry that Singapore isn’t included! Hello! I’ve been MIA for awhile…but I’m back! What a great deal and such wonderful art to work with! I’m back creating and this bundle is a great inspiration! Thank you so much for taking the time to leave us a comment. We are so pleased that this bundle has you feeling inspired and we hope that you will have loads of fun getting back into the swing of things! 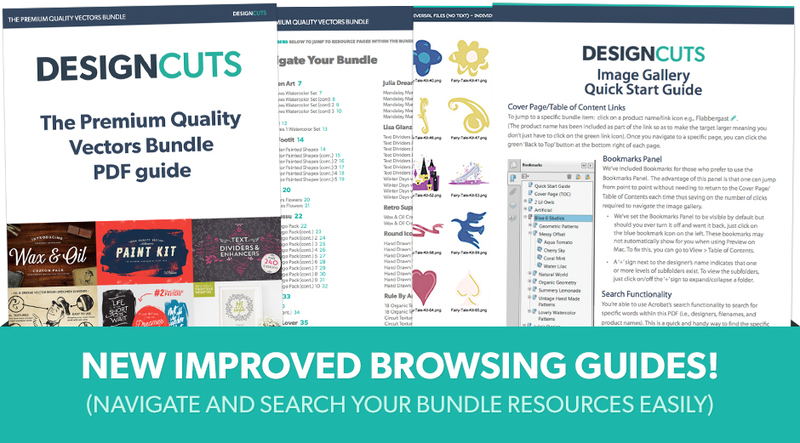 This is another fantastic bundle, Design Cuts! There’s a lot to love here. If I had the time, I’d probably play with every package in this bundle. I’m especially looking forward to using the mandalas and star maps, but I’m sure I’ll come back to this bundle for more goodies down the road. Brilliant work, folks! Your support means so much to us Pete and we cannot thank you enough for the great feedback! Another amazing selection of goodies! Thanks so much for the awesome feedback- we’re glad you love it! We promise to keep pumping quality illustrations and vectors in the upcoming bundles! Thanks so much for the comment and thank you for being a part of this one! We are delighted to be able to work with you :). How? How do you do this so damn consistently?! I can barely keep a regular schedule of updating minor things on my site and yet you guys churn out these amazing packages in so little time. I’d understand if most of these were crap, filler graphics but this is stellar sh!t from A to Z. Thanks so much for the awesome comment and we really appreciate your support! Our product team, who put the bundles together do an amazing job and I am not entirely sure that there isn’t some form of magic involved! Please do let me know as well Tibor if there are any resources that you would love for us to feature for you as we love to make our bundles as tailored for our community needs as we can :). I’m considering divorcing my husband and marrying every single one of you. Or at least taking you out for a nice steak dinner! Vectors, good LAWD! Love you all, thanks for being tip top. This comment is the best lol! You would need to get in quick with the marriages though as the first DC wedding is later this year and then we have another one planned for next year with SJ’s Christmas engagement… :). We are so happy that you are love this bundle and we hope you get lots of use out of your new items- please do feel free to share anything that you create with us as we would love to see what you are working on! Thank you so much for your incredibly kind words! It’s great to hear that you are liking the look of these vector items and that you are re-discovering the fun of illustration and graphic design 🙂 We hope that your purchased resources are helping out with this! Thanks again for your lovely comment, Gee. It really means the world to have your support 🙂 We hope you continue to have fun designing and if there is ever anything I could assist you with please do get in touch. I’m always happy to help! Gee – that is too funny. My cats have noticed… but no worries, they are still well fed. If you have the time for it, there are tons of outlets for your creative ventures in the freelance world that don’t require a full-time commitment… Even some options for do whatever you can, whenever you can. That’s the direction I had to go, since I have a regular, full-time, not-very-creative job of my own. At the same time, it’s great to hear that you’ve worked your creative skills into your role in education. Would love this, except for the mandalas. Though beautiful shapes and designs, I cannot use them. I’m not saying they would spoil the package for most, but they do for me personally. I know you can’t please all the people, all the time. I’ve seen celtic, even some satanic, wiccan, astrological, mythological, Buddhism, Judaism, native American, and other world religious iconographic styles. So, I would love to see you incorporate some Contemporary and Historical Christian religious symbols and designs in some of your packages. Or perhaps put together a separate religious section or package… Maybe you have and I have not seen them – feel free to correct me. This is just a thought. I surely appreciate the beautiful artwork you provide. Thank you for listening. Thank you so much for your feedback! We really appreciate you taking the time. I’m really sorry to hear that the mandalas will not be a good fit for you but rest assured, we will certainly take this on board and keep a sharp eye out for these resources that you are after 🙂 If there are any particular resources that you had in mind, please do not hesitate to send me some links and I will do my very best to source them for you. Thank you again for your feedback, Maura, and I apologise for any disappointment caused with this bundle. If you have any other suggestions for resources or if there is ever anything I could assist you with please do get in touch. I’m always happy to help! Joining the conversation, I’d like to point out that it doesn’t get any more Christian than Christmas itself, of which we got plenty just last month. At least three bundles I can’t recall were heavy on Christmas stuff. On the other hand, as I actually mentioned to Carol, there is only one -One- Hanukkah product. One. Maura, just do a search for the word Christmas on the Marketplace and you’ll see how many products come up in that search. Anyone here would be hard-pressed to find a better Historical Christian religious symbol than Santa for example. However, and please correct me if I am wrong, I don’t recall seeing any Budhas in the Marketplace. Also, as a scientist and a published amateur astronomer, it is my pet peeve when people equal constellations with astrology. Huge pet peeve of mine. Astronomy is a natural science that studies celestial objects and phenomena. It applies mathematics, physics, and chemistry, in an effort to explain the origin of those objects and phenomena and their evolution. So if you – or anyone- think constellation charts are about astrology, please don’t. Finally, Mandalas are geometrical forms (geometry is also a science). They are related to fractals, and the Fibonacci numbers all of which are mathematical concepts. The Fibonacci numbers were first described by Leonardo Bonacci —also known as Fibonacci, an Italian mathematician.While I”ll give you that mandalas are used in Buddhism, they don’t necessarily represent religious ideas or concepts. We humans are inherently attracted to symmetry because symmetry is present everywhere in nature. It is natural for the human eye to be pleased by objects that follow the Fibonacci sequence. This has nothing to do with esoteric practices but with math and how the human brain interprets the universe from a neurophysiological point of view. Pineapples, pines cones, sunflowers, yellow chamomile flowers, a Nautilus shell, a Romanesco broccoli, mandalas and the inheritance of the human X chromosome all have in common the Fibonacci numbers. It’s all science and it has nothing to do with religion. If we are to classify mandalas under esoteric or pagan illustrations, then we’d have to include all the above in that as well. And pretty much everything else found in nature. I’ll be more than happy to provide scientific articles on the subject if you would like to read more about it. But for now, I’ll leave you with the beautiful words of Galileo Galilei, Italian astronomer, mathematician, and physicist: “The universe cannot be read until we have learnt the language and become familiar with the characters in which it is written. It is written in mathematical language, and the letters are triangles, circles and other geometrical figures, without which means it is humanly impossible to comprehend a single word.” And also by Galileo: “Mathematics is the alphabet with which God has written the universe”. For the record, both Galileo and Fibonacci were very much Roman Catholic. With this in mind, it is easy to see why geometric forms have been associated with the sacred all across the history of humankind. Galileo had it right. Mathematics IS the alphabet with which God has written the universe, whatever your idea of God is. You all are always very kind and receptive to people’s thoughts. I am not entirely disappointed. In all I am absolutely blessed by Design Cuts – and all you do for us as designers to give us high quality art at a steal! So please no apology necessary. It was just an observation, and by Christian – I mean Crosses, symbols and icons that reflect the various traditions, Holy-days (holidays). You do provide a great deal of Christmas art – which I appreciate, but very little of the holy symbols of Christmas, like the holy family, the Star of Bethlehem, Things which depict the spiritual connotation of the holiday. Since the Mandala IS in fact the NAME of the RELIGIOUS symbol used in Buddhism, “A mandala (Sanskrit: मण्डल, lit, circle) is a spiritual and ritual symbol in Hinduism and Buddhism, representing the universe. In various spiritual traditions, mandalas may be employed for focusing attention of practitioners and adepts, as a spiritual guidance tool, for establishing a sacred space, and as an aid to meditation and trance induction.” The name is what makes it a religious symbol. If you were to call them geometric symbols – that would be that. I have used the search tool – I can find hits for Mandala, Chakra, Spiritual (More Buddism & Hinduism) & ‘Jewish’ I find (Hannakuh which shows two of their most sacred symbols, the star of David and the Mennorah). However, when I type in Christian (ity) – nothing, Christ = only generic/Christmas/winter designs, NO crosses, Star of Bethlehem, Holy Family (Mary, Joseph, Jesus) no wise men, shepherds or angels. When I type in EASTER – not one bundle contains a cross, which is the MAIN icon and theme of this Holiday. When I type in Cross = nothing. I love geometry, I am also obsessed with the intricacies of intelligent design – found everywhere in nature – as stated in Claudia’s reply. I adore fractals – it’s all good. But Santa is not Christmas – CHRIST is Christmas. All I’m saying is if you have religious symbols (by name-Mandalas) offered to us – my goal was to simply ask if you could provide some Christian religious symbols as well. I thought it would even be cool to have a religious section — for whatever YOU choose to offer. I can find what I need elsewhere. But I didn’t think it would hurt to ask. Thank you for your time. PS: Claudia – thank you for your input. Just so you know, I am aware of the difference between astronomy and astrology – And I am not trying to lump everything into one pagan category. My thought was to simply request a few Christian spiritual symbols be considered in a package. Mandalas are beautiful yes, mathematical, yes – but they ARE used for religious purposes, like Labyrinths and mystical circles. They are icons which mean something to the practitioner of the religion. I know what I’m talking about. It’s really not a big deal – just expressing my view. I do agree with Galileo – God is the creator of of the universe and all that is intelligently designed within it. 🙂 Have a wonderful day using your creative gifts! I thought this one might have that effect on you… lol! I know that this one has a few bits in it that you were after :). We cant wait to see what you create with this one Claudia! Ok, now I get it. In the next survey I need to tell you all what I DON’T want – pretending it is what I want – in order to get a week now and then where I can keep a few bucks in my bank. And now that I know there will not be an end of the year chance to pick up missed bundles, it makes it all the more stressful to consider not picking up every deal. On a more serious note, please do not stop. Keep these deals coming. I am not that destitute. I will not go hungry, or naked – (well, not unless I want to) – or without shelter. If I don’t spend the money on these deals, I will spend it on something else. And that something else will be far less satisfying in the long run. Thank you all again for another great bundle. P.S. I really like the video work for the Trailer for the bundle. Nicely done animation. Gives me even more ideas for how to use the items. Thank you so much for your kind words! It really means a lot that you enjoyed the video 🙂 I hope you enjoy working with your new vector items! I’m also a little bummed we don’t have another opportunity at some of those bundles I missed last year. But I agree, keep em coming! Thanks guys. Thank you for your comment, I’m so sorry for any disappointment caused with us no longer re-running our previous bundles. As Carol mentioned to Louis, since a lot of our previous bundle items are either in our marketplace currently or on our radar for a future addition, we have now decided against re-running the bundles. Rest assured though, we’ll be sure to keep the awesome bundles coming and more items regularly popping up in our marketplace 🙂 If there is anything in particular you’d like see added soon, please do let me know and I will do my best to source them for you! I agree, it’s really dissapointing that we didn’t have the chance to repurchase missed bundles this year. I remember reading, that you chose not to do so this time because of the marketplace.You mentioned in a comment, that a lot of the missed products from bundles can now be bought in the market place, which is like the new way to purchase missed items. This would all be totally cool and fine, if you really did have a lot (or most) of the items from past bundles to purchase. Unfortunately that’s not really the case and most of the items I regret missing, are not available in the marketplace. I wonder if you still plan to add items from old bundles or not. Also, I would have one suggestion concerning the market place. Please add a wishlist button 🙂 That would be extremely helpful and make keeping track of favourite items much easier! Thanks again for your feedback, Silvina! We really appreciate you taking the time but please do let me know if you had any more suggestions or queries I can help with! Thanks so much for the comment and for the feedback on the video- Ben will be delighted to hear his work has inspired you even more! I am so sorry to hear that you are disappointed about the bundle re- runs not occurring- as we now put a lot of the items from our bundles into the Marketplace or on the queue to go in there, the bundle re- runs were decided against. We currently don’t have any plans to feature the re- runs of older bundles in the way we used to. We definitely don’t want to cause you any stress though Louis so my apologies for this! I can confirm though that we will keep the bundles coming so no fear there so stay warm, dressed (optional!) and fed Louis as we have you covered :).